As a kid, probably like most kids, I was not a fan of beets. Strangely, It wasn't until I started making baby food that I started liking them. People always talk about how gross baby food tastes and I just don't understand why they would expect their babies to eat it then! I think that their food should taste just as good as mine so I would always taste the food before feeding them, making sure it was edible. One combination that always went over great was beets and apples. Recently, I posted about my favorite 15 Easy Peasy Baby Food Purees. Writing about the beets and apples got my tastes buds wanting a bite ... great timing, because I have quite a few beets from my Aunts garden! We hadn't had our daily juice so I figured we would have a beet and apple juice instead of making beets for dinner. I was trying to take a picture of the juice and the kids kept trying to steal the juice off the table. I was a little leery of them actually liking the juice because they are not huge beet fans anymore but they both downed it! This juice was equal parts fruit and veggies so it wasn't overly sweet but the apples pair so well with the flavor of the earthy beet that they loved it! 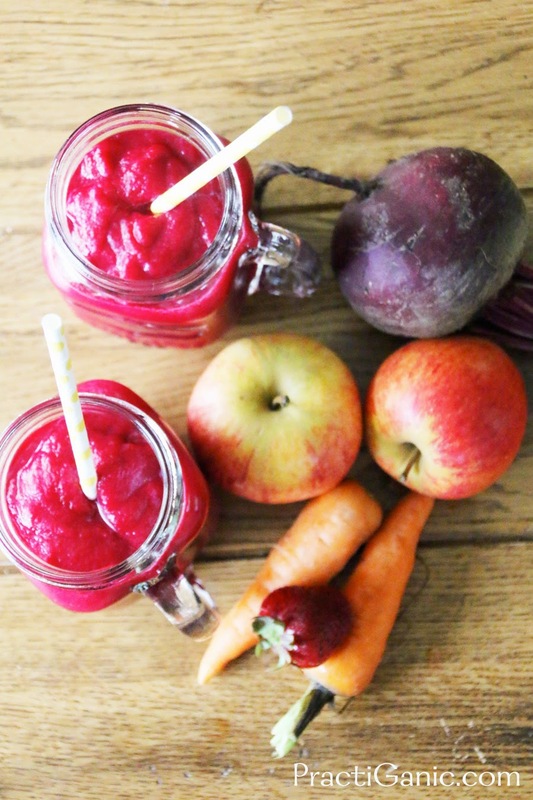 This may be the brightest juice that I have ever made ... Not only does the hot pink really get your moving in the morning but all the great vitamins and minerals from the beets, apples, carrots and strawberries really put a skip in your step!! 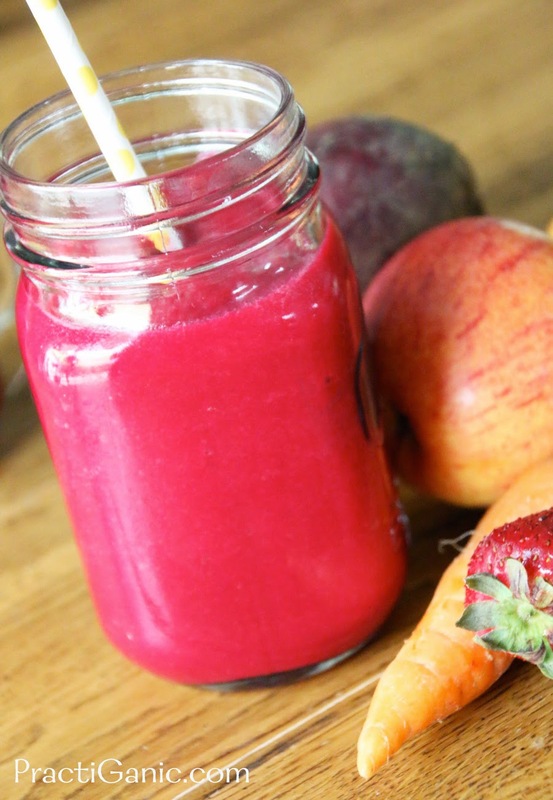 Regardless of your love of beets, give this juice a try ... you may surprise yourself! 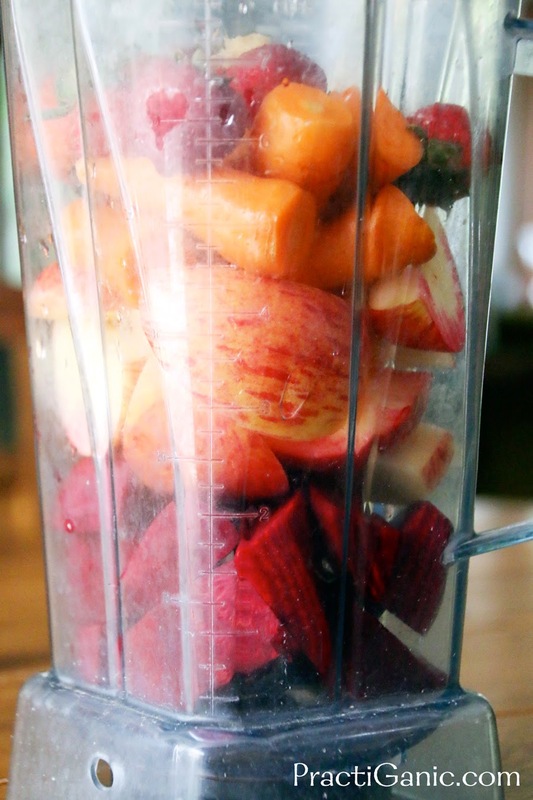 Put all ingredients in the blender. Enjoy!